Whenever I get together with other writers and bloggers, branding is a favorite topic of conversation. What version of their name to use, how to find a Twitter name that isn’t already taken, and the list goes on. When it comes to branding, it’s easier to do it right the first time than to go back and re-do it. I know — I went through my own personal rebrand several years ago and learned a lot through the process. I finally compiled all my tips on branding into a three-page resource that’s available as a free download right here. Take a few moments to review the checklist, then follow the links below for more insight into the world of personal branding! 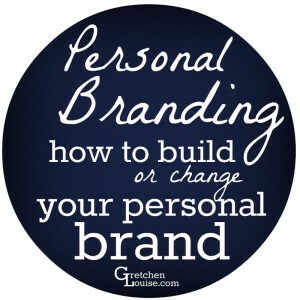 Are You A Personal Brand? It is a relief to know that I have someone I trust that I can contact to take care of the technical side of my website. I appreciate so much all the work Gretchen is doing to help me make my website as functional, user-friendly and effective as it can be.